STOCKHOLM — Finlands Juha Sipilä is trying to reboot his premiership a month ahead of parliamentary elections that could see his liberal party cede ground to the Social Democrats. 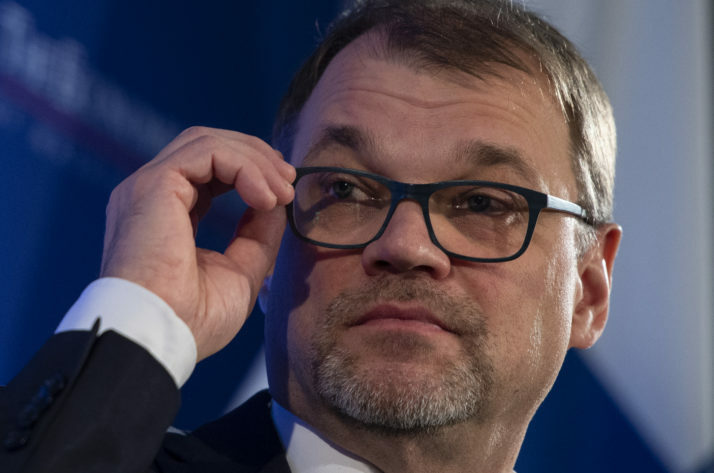 Having failed to deliver a wide-ranging reform package, Sipilä, a former IT executive, hit the off switch on Friday morning and told President Sauli Niinistö he would resign. But by the end of the day, the power was back on. Niinistö had reappointed Sipilä as caretaker leader. With his heavy reform agenda ditched, the Finnish leader should now have a freer hand to relaunch his misfiring reelection drive as campaign season kicks into high gear ahead of a general election on April 14, analysts say. Now that the government coalition has officially collapsed, the parties that formed it may also find they have more freedom to campaign to their own individual strengths and move the debate away from their failed reform efforts and poor showings in opinion polls. With its rural roots, the Center Party, for example, has typically appealed to voters by promising to decentralize power and support farmers. Its platform for the April vote centers around promoting equality in all regions of Finland as well as supporting families and fighting climate change. “The image of a fresh start might help,” said Teivo Teivainen, a political scientist at the University of Helsinki. Sipilä, a former executive with a number of technology firms in Finland, won power in 2015 vowing to run Finland like a company. Later that year, he successfully pushed through an austerity package despite widespread protests and has been credited with returning the economy to growth. Unemployment has fallen and public finances have strengthened. But the reform package that Sipilä put on ice on Friday ran into a series of problems and ultimately proved a liability. On Friday, Sipilä sought to cast his departure as an honorable move, a leader accepting responsibility for a failure to deliver on a central element of his governments platform. Opposition leaders see it differently, describing the attempted reform as overambitious and doomed to failure from an early stage. Finland currently organizes its health and social care through 295 municipalities, a system that has been criticized as inefficient for a population of around 5.5 million. Sipilä had, among other things, sought to introduce a system for service provisions based on 18 administrative centers. Meanwhile, his coalition partners in the National Coalition Party (NCP) pushed hard for users of the service to have more freedom to choose between providers. The changes got stuck in various committees and it started to look highly unlikely that the reform could be successfully passed in time. “This is a huge disappointment for me,” Sipilä said about his decision to put it on hold. His travails have opened the door for a potential Social Democratic win in April, which would be something of a rarity in Europe, as center-left parties have faced a steep decline in polls across the bloc. A victory for the Social Democrats could see some of Sipiläs austerity initiatives rolled back and more emphasis on classic center-left policy areas such as the promotion of income equality in society and increased spending on welfare. But it is still unclear what kind of coalition may be formed after the election. If the Social Democrats were to win, they might reach out to one or more of the current governing parties — including the Center Party or the NCP — or they may seek to work with the Greens, the Swedish Peoples Party or others, analysts said. The governing parties are in need of a boost ahead of the election, opinion polls show, particularly Sipiläs Center Party, which has been flagging as a result of its unsuccessful bid to redesign the countrys health and social care provisions. Among other things, the proposed reforms emphasis on private-sector service provisions — pushed by center-right NCP — didnt seem to prove a hit with voters. The opposition Social Democrats are currently ahead with 21 percent support versus 14 percent for the Center Party, which finds itself in third place, according to pollster Taloustutkimus. The anti-immigration Finns Party, which was kicked out of government in 2017 after electing a new hard-line leader, is polling at 13 percent. A splinter group from that party, known as Blue Reform, stayed part of the governing coalition but is only polling at 1.8 percent support. Sipilä will spend the next month trying to engineer a turnaround. This article is part of POLITICOs premium policy service: Pro Health Care. From drug pricing, EMA, vaccines, pharma and more, our specialized journalists keep you on top of the topics driving the health care policy agenda. Email pro@politico.eu for a complimentary trial.